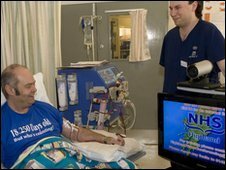 A video conferencing system has been installed in two hospitals to improve the care of kidney patients in the far north of Scotland. The link connects the main renal unit at Raigmore Hospital in Inverness with Caithness General Hospital in Wick. NHS Highland said the initiative should help reduce waiting times and travelling for patients. Consultant Dr Robert Peel said an increasing number of patients from Caithness required dialysis treatment. Specialists from Raigmore Hospital will continue to hold monthly clinics at the hospital in Wick to assess patients receiving dialysis treatment. But every other month, these reviews will take place via the video link, using mobile units which can be placed alongside the dialysis stations. The use of the technology means fewer outpatients from the Caithness area will have to make the 200-mile round trip for appointments in Inverness, according to the health board. It will also allow specialists to see more patients in the available time, NHS Highland said. Dr Peel, a renal consultant at NHS Highland, said the initiative would help reduce pressure on clinics in Caithness for kidney patients. "It should be possible for more outpatients to be seen locally during the monthly clinics, with shorter waiting times for appointments," he said. A regular live video link will also enable nurses in Wick to discuss patients' treatment with specialists in Raigmore. Staff will be able to use the system to join in training sessions held at the Inverness hospital, without having to travel to the site. The link has been installed under the Competitive Health Services project, which has been set up with EU funding to look at how modern communications technology can be used for healthcare in sparsely populated areas. This project aims to share knowledge of telehealth projects between Finland, Sweden and Norway and Scotland. A similar teledialysis link has been used in the far north of Norway since 2000, to connect a main renal unit with three outlying clinics.